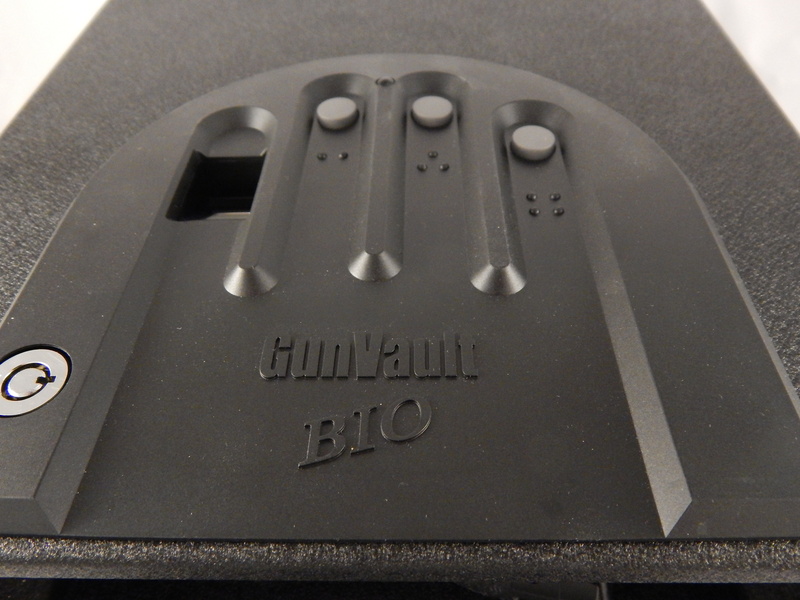 When Gunvault mailed me the box containing a pair of GVB2000 biometric safes, I wasn’t surprised by the size of the box, it was the weight that caught me off guard. The box weighed in excess of 30 lbs. All that was inside were a couple of handgun safes. I have been hands-on with plenty of them over the years, none of them felt like this. So my first impression was very positive, as I believe, when it comes to steel, weight means thickness, quality and durability. 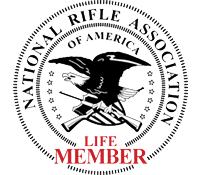 The day I got the safes in the mail, I saw a disturbing video on YouTube that claimed to demonstrate opening a Gunvault handgun safe using only a paperclip in record time. (First it should be said, almost all safes have a weakness if you research them enough. Several large safes can be opened if you know the right place to stick a magnet to the door. Any safe can be broken into if you have enough time. There is no such thing as an impervious safe.) My immediate reaction to the video was to attempt the paperclip attack on the GVB2000. There is no vulnerability in this model safe to such an attack. So why is each safe about 16 lbs? 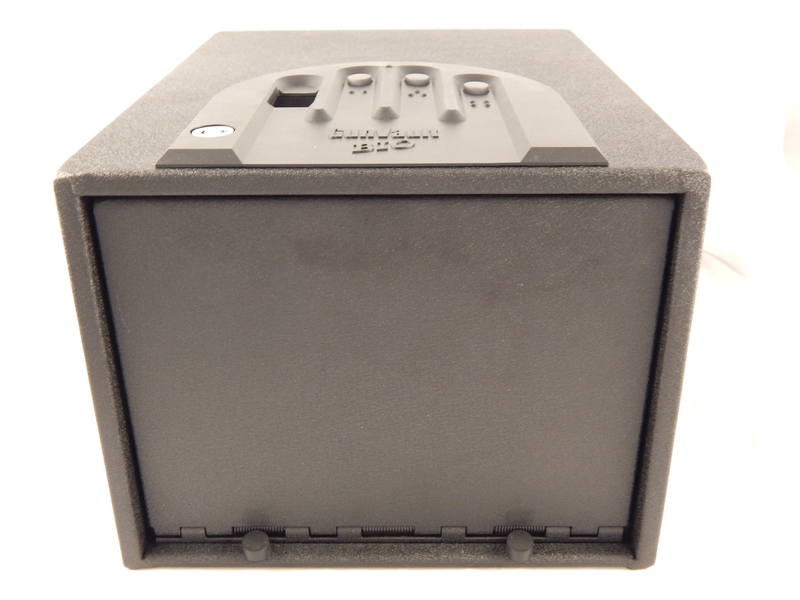 The outside skin of the safe is 16 gauge steel. That thickness of steel significantly heavy for a safe that could be called portable. Further, the door gap is very thin, so pry attacks would be difficult. The entry method on this safe is biometric. Fingerprint scanners, while considered a great alternative to a combination lock in theory, often have problems of their own. Most commercial biometric readers are somewhat clumsy. They don’t often read reliably, or they are too slow to be useful. Whether due to the quality of the product or my own knowledge of biometrics, I had no difficulties with the reader built into the GVB2000. The scanner is on the top of the GVB2000 with 3 buttons beside it (each marked with a number). While the index finger is on the scanner, the middle finger hits the first button to activate the reader. The ring and pinky finger buttons are dummies. They would be functional on non biometric safes but in this case they are only a distraction for would be intruders. The scanner itself is capable of holding a large number of fingerprints with the first 2 scanned prints logged as administrators. In order to add further prints one of those prints must be entered first. 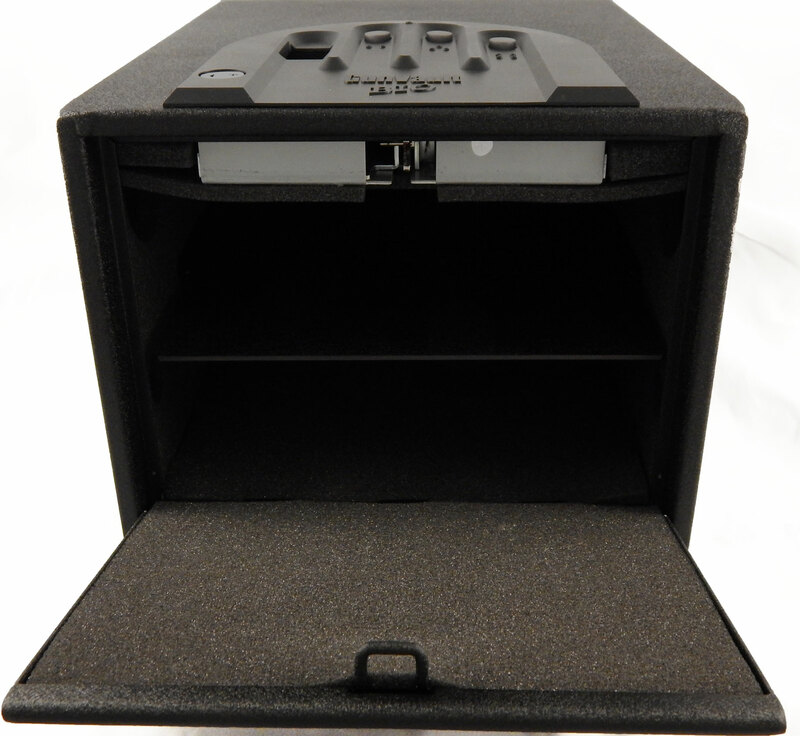 Inside, the safe is padded on most surfaces except the shelf (which is plastic) so that there is very little chance of scratching a firearm. The more unexpected surprise was the safe’s interior lighting. When the door opens there is a LED chip mounted in the ceiling of the safe that comes on momentarily to illuminate the contents. Thus, if you go for the gun in the middle of the night you will actually be able to see what your grab for. It’s a nice touch. Lastly, there’s the size of the safe. 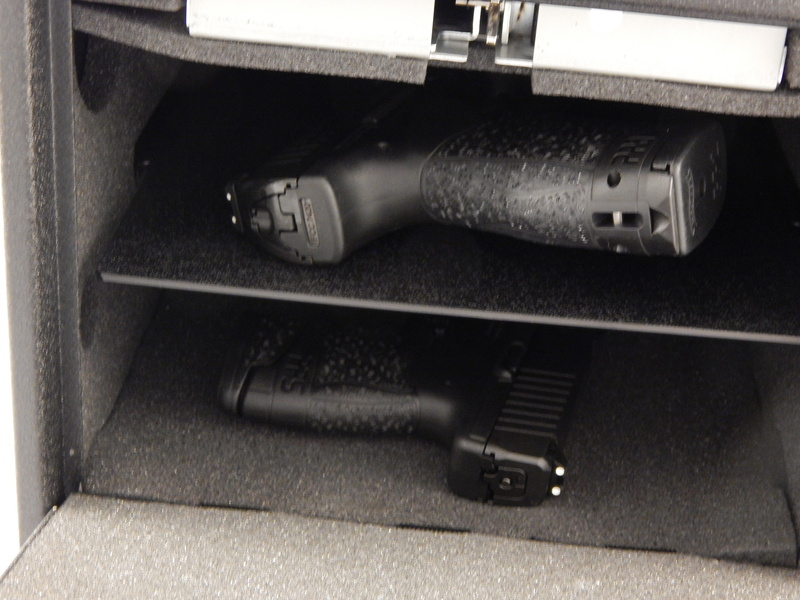 While most photos show the GVB2000 with a single pistol on each shelf, I was able to comfortably fit 5 pistols in the safe after removing the shelf. This was while the AC plug and other unpacked items were still in the safe behind them. So it’s safe to say my tendency toward subcompacts and snubbies didn’t have much to do with it. 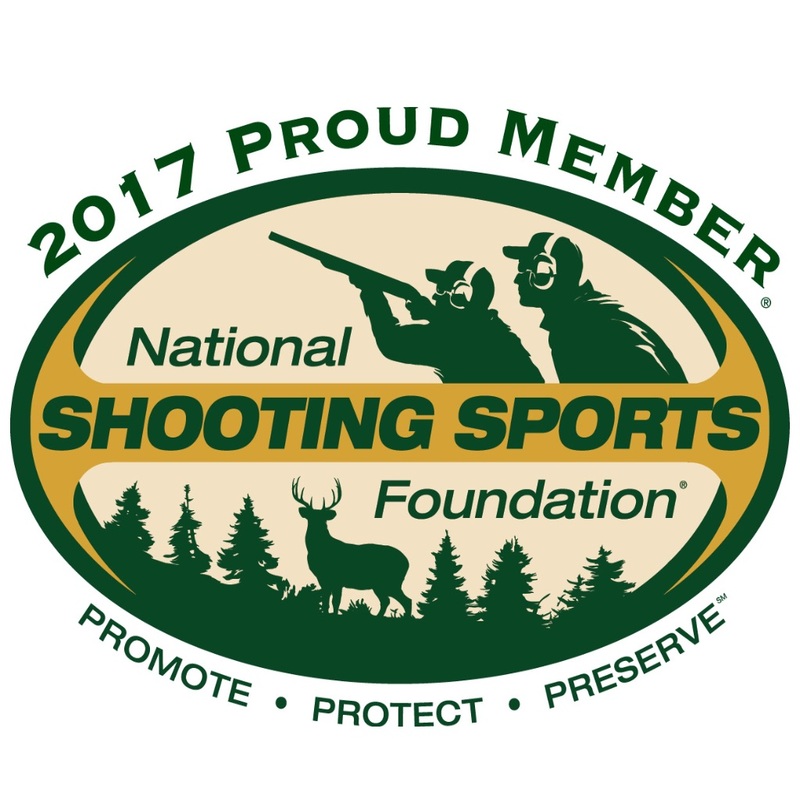 There’s ample room for full sized or larger framed firearms. 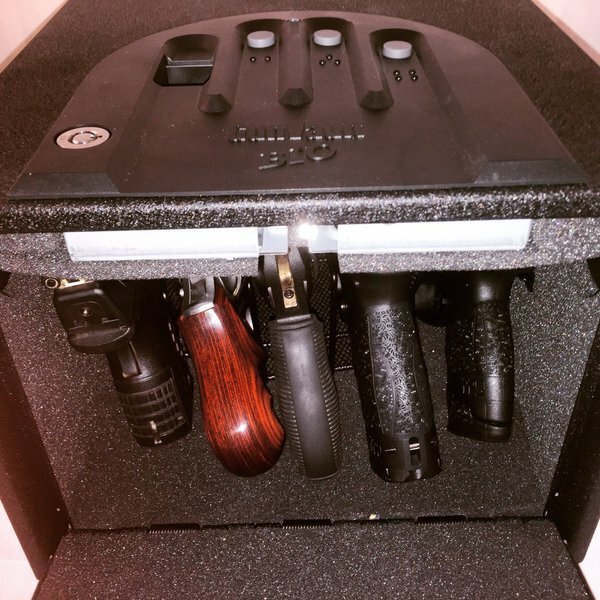 It’s safe to say Gunvault has earned the market share they have and the reputation for the best consumer strongboxes available today. I work with my hands and quite often they get cut or abraded which cause the biometric to fail . The safe was a gift from my daughter who did’t realize this when she purchased the unit . I could register all my finger prints but would have rather had a combination that didn’t rely on unmarred finger prints .